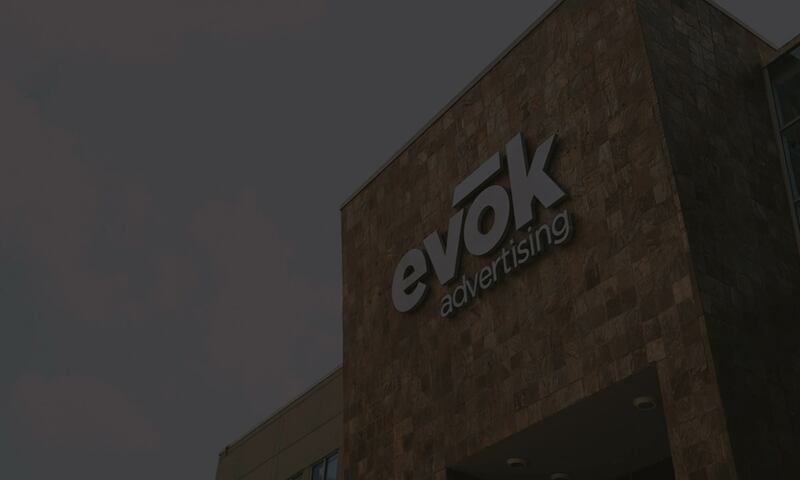 © 2019 Evōk Advertising. All rights reserved. Let’s talk about Amy and marketing travel. Who’s Amy? And what does she have to do with marketing your travel destination? These are all great questions—let’s dig in. Our friend Amy (as researched by Think with Google) had 419 digital moments planning her trip to Disney World in just two short months. 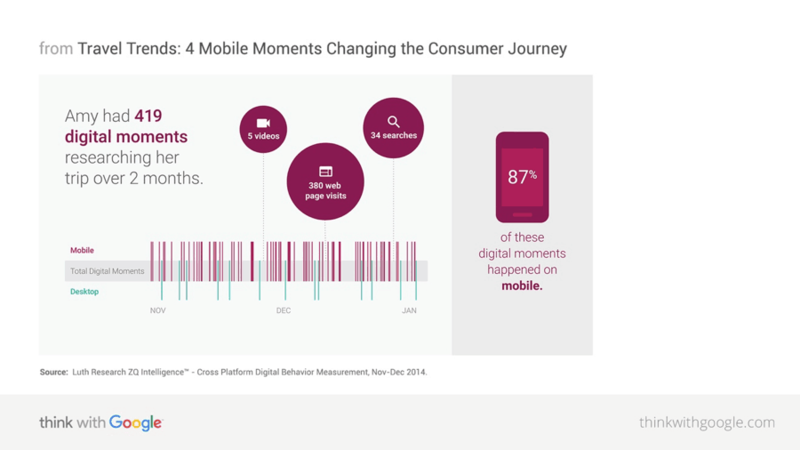 That’s 419 moments of reaching out to and interacting with her in the digital space. She visited 380 webpages, searched 34 terms and watched 5 videos. While a large portion of her online journey was most likely centered around Disney World, she was probably searching for other attractions, restaurants and shopping around the tourist hub of Orlando. So, let’s think about this for a moment. If Amy were searching and planning a trip to your destination, would you be there along the way guiding her journey? If you’re unsure or you wouldn’t even know where to start, we’re going to show you how to do just that today. The first step is to know what people like Amy are searching for. But how can you magically know what people want to know before a trip? Unfortunately, it’s not as simple as asking and then shaking a Magic 8 Ball for the quick answer. To truly know what users are searching for on Google or Bing takes time and effort. Not many of us have hours of free time laying around to do some heavy research, even light research. If you are one of the many with busy schedules, Google Trends will give you a quick start. This tool shows you the interest in a particular search term over time and by region. And it tells you related terms and topics people search for along with your specific search them. 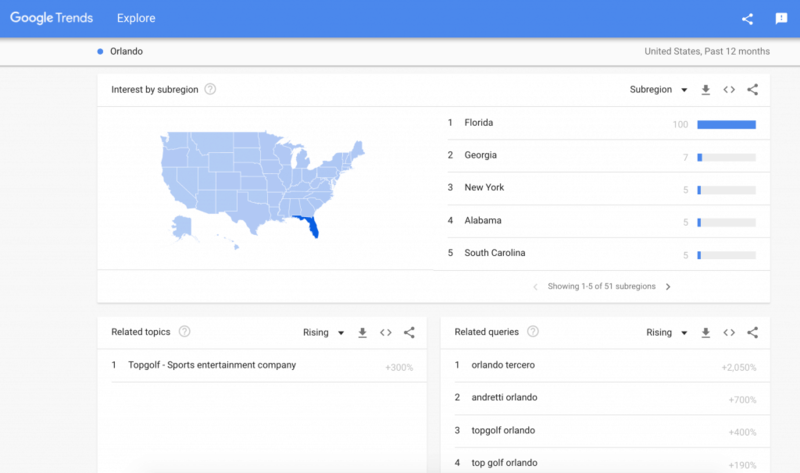 To get started, head over to Google Trends, type in the name of your city or town, and Google will show you with easily digestible charts and lists what users are typing into search engines to learn about your destination. Another user-friendly and free resource is a website called Answer the Public. This tool is similar to Google Trends, but rather than just showing keywords, Answer the Public generates questions users are typing into their search engines. Pretty cool, right? You can see the exact questions visitors want answers to for your destination. Take five seconds, right now, and go to Answer the Public. Just like Google Trends, type in your city and town, and you’ll get a compilation of all the questions users are asking about your destination—and if you love to show your data in Excel, you can even export it as a CSV. After you’ve gotten your feet wet with Google Trends and Answer the Public, you can dig deeper with keyword research tools like Google Keyword Planner, SEMrush, SpyFu or Moz. Some of these tools you have to pay for, and to really get the bang for your buck, you might want to look into taking an online course or learning more about keyword research and optimization before you get started. 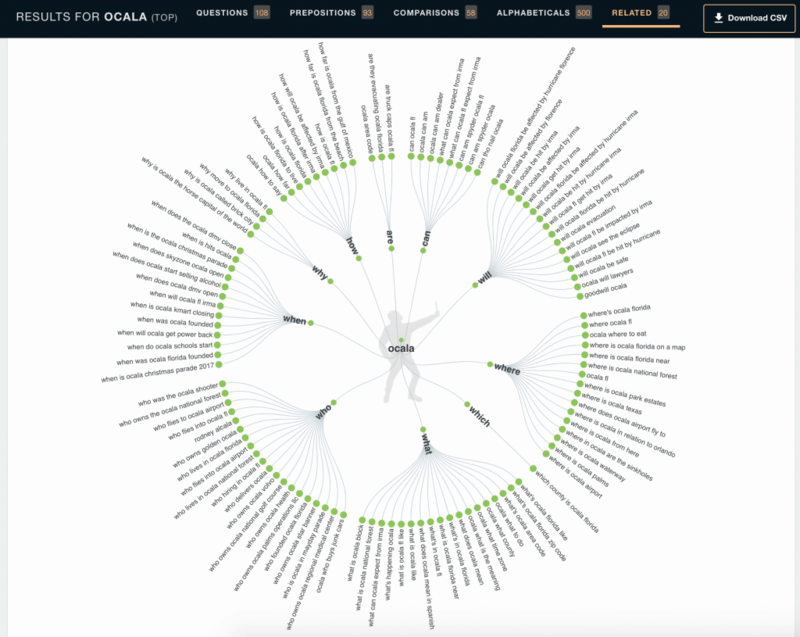 These tools offer valuable insights like monthly search volume for specific terms, keywords competitors are going after and even suggested keywords for your destination. After you’ve done your initial research and started to learn what users are searching online before a trip, the next steps are in your hands. The big question you have to answer is, how can you take these search terms and create valuable, useful content for potential visitors? Let’s talk about a few potential scenarios. If users are heavily searching for “things to do in Ocala,” consider creating a short video on the Top 10 Things to Do in Ocala. If users are searching for “where is Crystal River FL,” maybe you need to change your Facebook timeline photo to the state of Florida with a star on Crystal River. After you’ve hammered out the details on what your potential visitors are searching for and how you can give them answers in the form of digital content, you’ll need to start catering to their needs or wants. When visitors plan to come to your destination, they’re often on vacation or a weekend getaway. They don’t want to be stressed out trying to plan all the details of their trip—and that’s where you come in to do all the heavy lifting. 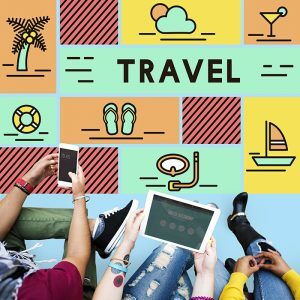 You can offer tools or applications that allow your potential visitors, for example, to create detailed itineraries or generate customized activity lists based on their personal preferences. But, of course, you can’t just blindly create tools or applications. Who your audience is in combination with your destination will dictate your ideas and creations. Take one of evok’s clients, Visit Sebring in Highlands County, Florida. The destination offers an array of activities from adrenaline-pumping experiences at Sebring International Raceway to mild, family-friendly fun with hiking trails at Highlands Hammock State Park. We knew our visitors wanted to plan their activities based on whether they wanted a low-key or high-intensity trip. So, we ran with it. The results turned into a one-of-a-kind destination website experience that showcases the breadth of activities with the Adventure Speedometer. When visitors land on the site’s homepage, they can choose to “Go Slow” and explore the county’s nature, arts and culture or fishing spots or take the pedal to the metal and “Go Fast” at the race track, nightlife events or other sports and recreation offerings. But now, let’s go back to Amy. What would she want to know when planning a trip to your destination? Would you know? If your answer is no, you might be pushing Amy to become a one-time visitor instead of a lifetime visitor. You should know what your visitors want to know and give it to them in the form of digital content. In this scenario, we’re only talking about one Amy. Imagine if there were hundreds or even thousands of Amys that you could convert into lifetime instead of one-time visitors. The potential for your destination could be endless. Look for us in your inbox! Would you also like to receive insights specific to your industry? 1040 N. Las Palmas Ave.